ProKick's Jake McCready from Dundonald will face, Rytis Daniules from Waterfront kickboxing association, Waterfront, ROI - the match is over 4 x 2 min rounds under Full-Contact rules. Here's another KICKmas Cracker, Just confirmed, an Irish School Boys title match-up. This late addition to the KICKmas line-up has the potential of being a great little warm-up fight before any of the main event fights, said promoter Billy Murray. Teenage KICKS will be a show-stopper on this FULL International fight-card. 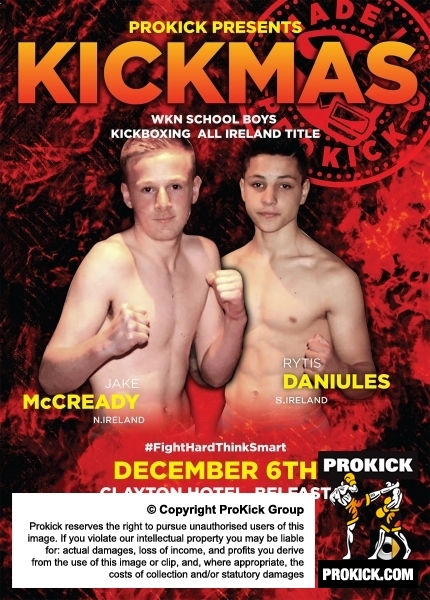 ProKick's 15 year-old Jake McCready from Dundonald will face 15 year-old Rytis Daniules from Waterford kickboxing association, Waterford, ROI - the match is over 4 x 2 min rounds under Full-Contact rules. Great fighting talents - they may be only 15 years-old but already both teenagers have a wealth of martial art experience, from over 30 light-contact fights between them, along with boxing, full-contact, low-kick and K1 style fights under their belts. Both are ready and excited about competing for this first new WKN All-Ireland School Boys title. Rytis Danielius fights out of the legendary Billy O'Sullivan's gym in Waterford and Jake McCready is a ProKick fighter. More on these two talents later. Great news, this should be a cracker match up, Jake is a very talented and dedicated young kickboxer. Looking forward to this fight. Good luck Jake. A true champion in the making. Fight Hard Think Smart Jake.